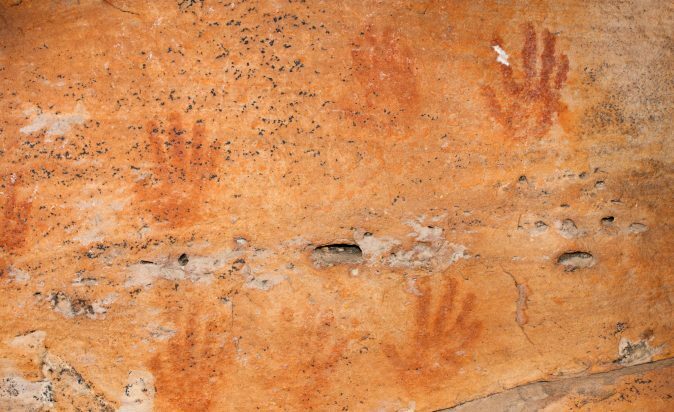 Did you know the Grampians is home to 86% of all Aboriginal rock art in Victoria?! Ever wanted to discover more about the history and culture of Australia but never thought it was possible unless you headed up north? I was surprised myself when I heard The Grampians National Park is home to the largest amount of significant Aboriginal rock art sites in southern Australia. With some of this art dating back over 22,000 years I thought it would be worth exploring the meaning behind it and visit some of the sites for myself. I started my journey in Halls Gap, about three hours drive from Melbourne, at Brambuk the National Park & Cultural Centre. Here I learnt that Gariwerd is the traditional name for the Grampians ranges. Gariwerd has long been known as a spiritual place to the local aboriginal Djab Wurrung and Jadawadjali peoples. After exploring further through the Cultural Centre I picked up a map and started to plan my rock art adventure. 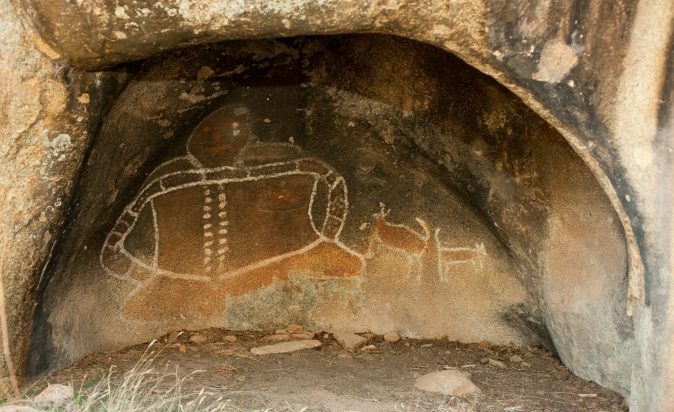 Despite Gariwerd having more than 200 rock art sites, only 5 are open to the public for spiritual reasons. (This was in fact a good thing as it would take me all year to get to all 200 sites!) I mapped out a logical touring route and then hit the road. My first stop was Bunjil Shelter, which was easy to access being located off a major road near the town of Stawell. 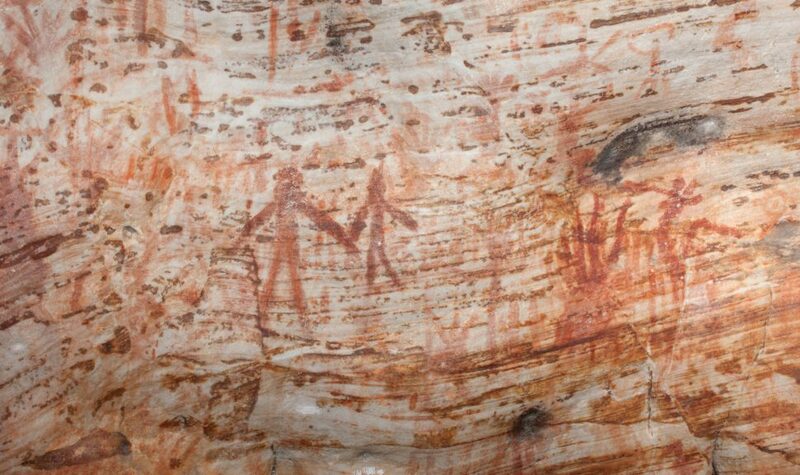 This shelter is widely regarded as one of the most significant cultural sites in south eastern Australia as it is the only known rockart painting of Bunjil, the spiritual creator of Gariwerd. The site is in The Black Range Reserve, and is an easy, scenic walk from the car park. The artwork shows Bunjil and two dingos who are Bunjil's helpers in creating the surrounding land. Signs close to the site explain how Bunjil is a principal legendary hero, who provides for all and remains as a protector of the natural world, his people and their beliefs. When Bunjil finished his creation works he transformed into an eagle, flying high into the sky, where he still lives today. After spending some time taking in the stories surrounding the art I head back to the car to journey around an hour North to the next sites. Gulgurn Manja and Ngamadjidj are both located at the northern end of Gariwerd and are easily accessible by road and walking trails. The largest in the north is Gulgurn Manja Shelter meaning “Hands of Young People“. After a 15-minute gentle walk to the site from Hollow Mountain Car Park I arrive at a rock shelf which features many painted hand prints including those of children, along with emu tracks and other symbols. These paintings were part of a unique local art style which was used to tell stories and pass on the law of The Jadawadjali people. Not only did this site provide me with some more rich Aboriginal stories but the view from up there was also well worth the walk! The final site for the day is Ngamadjidj meaning ‘white person’, on the western edge of the ranges near a small secluded waterhole. Remains of campfires and stone tools used by the Jadawadjali have been found here, which suggests it was a favoured camping place. I noticed that the painting at this site was done using only white clay, compared to the other sites that were mostly done with red pigment. 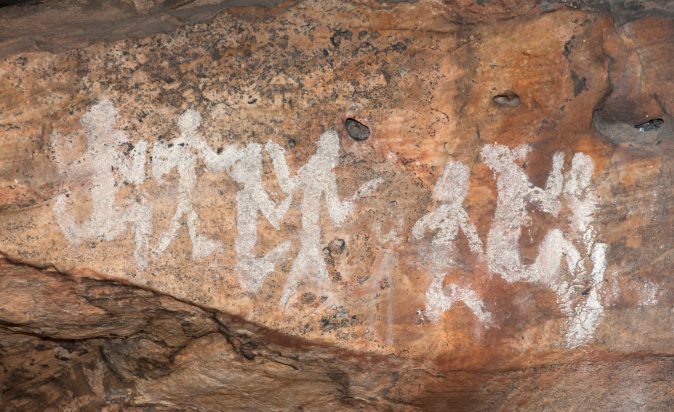 Sadly nothing is known about this paintings meaning as the traditional lifestyle of the Jadawadjali was changed by European settlers before it could be recorded. Billimina (Glenisla Shelter) and Manja (Cave of Hands) are two more sites located in the Victoria Range, about 1.5 hours drive from Halls Gap. Access to these areas is largely on unsealed roads in a more remote area of the National park. I didn’t have time to see these sites, but plan to return on another full day adventure soon. Overall my cultural journey was extremely rewarding, I felt a spiritual connection to the stories told through the art. Gariwerd is such a unique place in Victoria that is definitely worth visiting. It is important to preserve these sites so we can learn and appreciate significant aboriginal heritage of the area. All the sites that are open to the public are surrounded by cages which is unfortunate that they are required, but necessary as they protect the sites from vandalism and preserve them for future generations. If you do decide to visit please take care and respect the sites and their important cultural value.